This latest generation programable, multi-stage voltage regulator ensures that batteries will charge faster and last longer. An exclusive belt load management system allows the user to control the max alternator charging output to ensure the horsepower load does not exceed the limits of the drive belt. 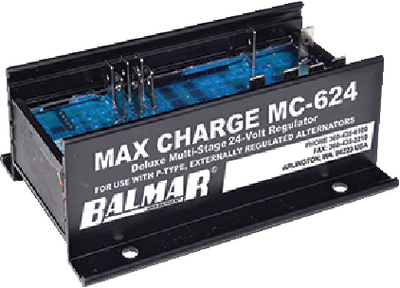 When used with optional temp sensors the Max Charge will automatically monitor and respond to changes in alternator and battery temps and will discontinue charging to protect the batteries and charging system. Programmable for use with 7 different battery technologies, including standard flooded, deep cycle flooded, AGM, Optima spiral wound and gel batteries. Size: "4.8"" x 3.2"" x 1.5"""